What scientific concepts are being taught with Jumbo Minds books? We cover a variety of topics in many scientific subjects (Biology, Chemistry, Space & Earth Science, Physics). Jumbo Minds is mindful of the current U.S. science standards and the STEM Education Coalition. Please click HERE to see how our books align with the National Science Education Standards and the Next Generation Science Standards. 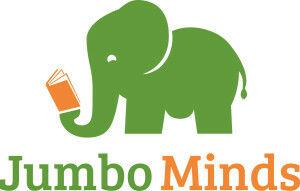 In what languages are Jumbo Minds’ books available? Currently, our books are available in English, and we intend to expand to other languages! At what age can I start reading Jumbo Minds’ books to my children? Please don’t wait! Start reading to your children as young as possible. Our ABC books are catered to ages 0 – 6 years old but the concepts and definitions are helpful to all ages up through elementary school. People of all ages can learn about quarks, centripetal force, and kettles! How can I use each type of book in my classroom? Read one word a week and support the learning of that word with hands-on activities. Add the words and definitions to bulletin boards, create concentration games, flashcards, jeopardy games, etc. Visit Our YouTube and Pinterest pages for additional ideas. Please let us know how you use these books in your classroom! What geographic area does Jumbo Minds serve? Currently, Jumbo Minds routinely ships to the US. Please contact us at info@JumboMinds.com for international rates. As soon as your package was sent, your tracking number was emailed to you. Please use this to track the delivery status of your package. If you did not receive or can’t locate your tracking number, please contact us at info@JumboMinds.com and we’ll be happy to forward that information to you! How quickly do you ship the order after it is received? We typically ship the package within the same day of the order if the order is placed during business hours. Jumbo Minds, Inc. accepts all major credit cards and PayPal. Does Jumbo Minds offer discounts? We do offer discounts from time to time. Please join or VIP list, Like our Facebook page, and Follow us on Twitter for discounts as they are offered. How did Jumbo Minds get its name? In short, we want to help children grow big (jumbo), active brains by creating excitement for science. Our more detailed answer has to do with creating/increasing synaptic (brain cell) connections in the brain during the human explosive brain growth period.